A hotbed of scientific exchange, the Royal Canadian Institute was formed in Toronto by an enthusiastic group of engineers, surveyors and entrepreneurs, led by Sir Sandford Fleming. Members gave and heard papers on a wide range of subjects. Selected papers and abstracts were published in the Canadian Journal, later the Proceedings and then the Transactions of the Royal Canadian Institute. 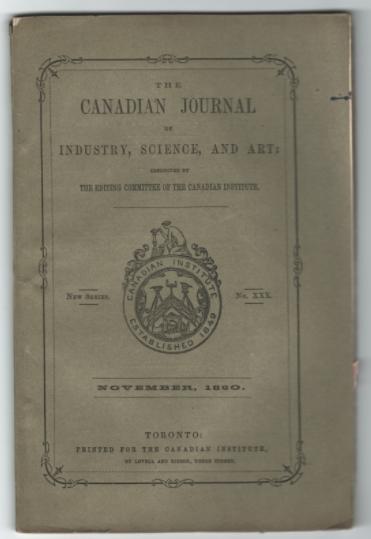 These scientific journals (1852-1969) were the first in Canada to be widely distributed internationally, and are still in demand as primary scientific sources. Originally housed in the Institute’s Richmond Street headquarters, the collection was transferred to the Royal Ontario Museum in 1924. With this display and the publication of an Annual Archaeological Report, the Institute made a major contribution to public appreciation of museums. Major accomplishments include the first public presentation of International Standard Time by Sir Sandford Fleming, The Museum of Natural History and Archaeology, and the creation of a Bureau of Science and Industrial Research which substantially influenced the creation of the forerunner of the National Research Council. The RCI also played a part in establishing the NRC Laboratories in Ottawa (1927) and the Ontario Research Foundation (1928). To the public, the Institute, or “RCI” as it was commonly known, was the place to go to hear and learn about science, with a regular program of lectures on the University of Toronto campus starting in 1913. After more than a century, and with few interruptions during times of global crisis, these lectures continue to take place today.